Sir Alexander Mackenzie (or MacKenzie, Scottish Gaelic: Alasdair MacCoinnich; 1764 – 12 March 1820) was a Scottish explorer known for accomplishing the first east to west crossing of North America north of Mexico, which preceded the more famous Lewis and Clark Expedition by 12 years. His overland crossing of what is now Canada reached the Pacific Ocean in 1793. The Mackenzie River, the longest river system in Canada and the second longest in North America, is named after him. Mackenzie was born in Luskentyre House in Stornoway on Lewis. He was the third of the four children born to Kenneth 'Corc' Mackenzie (1731–1780) and his wife Isabella MacIver, from another prominent mercantile family in Stornoway. When only 14 years old, Mackenzie's father served as an ensign to protect Stornoway during the Jacobite rising of 1745. He later became a merchant and held the tack of Melbost; his grandfather being a younger brother of Murdoch Mackenzie, 6th Laird of Fairburn. Educated at the same school as Colin Mackenzie, he sailed to New York City with his father to join an uncle, John Mackenzie, in 1774, after his mother died in Scotland. In 1776, during the American War of Independence, his father and uncle resumed their military duties and joined the King's Royal Regiment of New York as lieutenants. By 1778, for his safety as a son of loyalists, young Mackenzie was either sent, or accompanied by two aunts, to Montreal. By 1779 (a year before his father's death at Carleton Island), Mackenzie had a secured apprenticeship with Finlay, Gregory & Co., one of the most influential fur trading companies at Montreal, which was later administered by Archibald Norman McLeod. In 1787, the company merged with the North West Company. On behalf of the North West Company, Mackenzie traveled to Lake Athabasca where, in 1788, he was one of the founders of Fort Chipewyan. He had been sent to replace Peter Pond, a partner in the North West Company. From Pond, he learned that the First Nations people understood that the local rivers flowed to the northwest. Acting on this information, he set out by canoe on the river known to the local Dene First Nations people as the Dehcho, (Mackenzie River) on 3 July 1789, following it to its mouth in the hope of finding the Northwest Passage to the Pacific Ocean. As he ended up reaching the Arctic Ocean on 14 July, it is conjectured that he named the river "Disappointment River" as it did not lead to Cook Inlet in Alaska as he had expected. The river was later renamed the Mackenzie River in his honor. In 1791, Mackenzie returned to Great Britain to study the new advance in the measurement of longitude. Upon his return to Canada in 1792, he set out once again to find a route to the Pacific. Accompanied by two native guides (one named Cancre), his cousin, Alexander MacKay, six Canadian voyageurs (Joseph Landry, Charles Ducette, Francois Beaulieux, Baptiste Bisson, Francois Courtois, Jacques Beauchamp) and a dog simply referred to as "our dog", Mackenzie left Fort Chipewyan on 10 October 1792, and traveled via the Pine River to the Peace River. From there he traveled to a fork on the Peace River arriving 1 November where he and his cohorts built a fortification that they resided in over the winter. This later became known as Fort Fork. Mackenzie left Fort Fork on 9 May 1793, following the route of the Peace River. He crossed the Great Divide and found the upper reaches of the Fraser River, but was warned by the local natives that the Fraser Canyon to the south was unnavigable and populated by belligerent tribes. He was instead directed to follow a grease trail by ascending the West Road River, crossing over the Coast Mountains and descending the Bella Coola River to the sea. He followed this advice and reached the Pacific coast on 20 July 1793, at Bella Coola, British Columbia, on North Bentinck Arm, an inlet of the Pacific Ocean. Having done this, he had completed the first recorded transcontinental crossing of North America north of Mexico, 12 years before Lewis and Clark. He had unknowingly missed meeting George Vancouver at Bella Coola by 48 days. He had wanted to continue westward out of a desire to reach the open ocean, but was stopped by the hostility of the Heiltsuk people. Hemmed in by Heiltsuk war canoes, he wrote a message on a rock near the water's edge of Dean Channel, using a reddish paint made of vermilion and bear grease, and turned back east. The inscription read: "Alex MacKenzie / from Canada / by land / 22d July 1793" (at the time the name Canada was an informal term for the former French territory in what is now southern Quebec and Ontario). :418 The words were later inscribed permanently by surveyors. The site is now Sir Alexander Mackenzie Provincial Park and is designated a First Crossing of North America National Historic Site. In 2016, Mackenzie was named a National Historic Person. In his journal Mackenzie recorded the Carrier language for the first time. In 1801 the journals of his exploratory journeys were published. He was knighted for his efforts in the following year and served in the Legislature of Lower Canada for Huntingdon County, from 1804 to 1808. In 1812 Mackenzie, then aged 48, returned to Scotland, where he married 14-year-old Geddes Mackenzie, heiress of Avoch. They had two sons and a daughter. Her grandfather, Captain John Mackenzie of Castle Leod (great-grandson of George Mackenzie, 2nd Earl of Seaforth), purchased the estate of Avoch with money left to him by his first cousin and brother-in-law, Admiral George Geddes Mackenzie. Lady Mackenzie's father was a first cousin of the father of George Simpson, Governor of the Hudson's Bay Company. The Mackenzies lived between Avoch and London. He died in 1820 of Bright's disease, at an age of 56 (his exact date of birth unknown). He is buried near Avoch on the Black Isle. The Alexander Mackenzie rose (Explorer Series), developed in 1985 by Agriculture and Agri-Food Canada, was named in his honour. The Mackenzie River is named for him, as is the municipality of Mackenzie, British Columbia, and the Mackenzie Mountains, a mountain range in northern Canada. 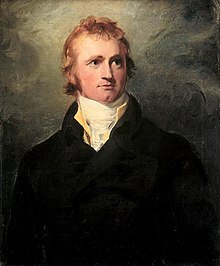 There are a number of schools in Canada named after him, such as Sir Alexander Mackenzie Senior Public School in Toronto, Sir Alexander Mackenzie Elementary School in Vancouver, and Sir Alexander Mackenzie Elementary School in St. Albert. He is referenced in the 1981 folk song "Northwest Passage" by Stan Rogers. Between 1989 and 1993, the Mackenzie Bicentennial Sea-to-Sea Expeditions of Lakehead University attempted a segmented re-enactment of the journey between Montreal and Bella Coola, British Columbia, but was unable to complete the final overland 350 kilometres (220 mi) Grease Trail when its First Nation owners refused permission. ^ Thompson, Frank G. "Alexander Mackenzie from Stornoway to the Pacific". Stornoway Historical Society. Archived from the original on 5 January 2016. Retrieved 17 September 2015. ^ "Sir Alexander Mackenzie". Encyclopædia Britannica. Retrieved 17 September 2015. ^ a b c d Lamb, W. Kaye (1983). "Mackenzie, Sir Alexander". In Halpenny, Francess G (ed.). Dictionary of Canadian Biography. V (1801–1820) (online ed.). University of Toronto Press. ^ a b Gough, Barry M. (1997). First Across the Continent: Sir Alexander MacKenzie. Norman, Oklahoma: University of Oklahoma Press. ISBN 978-0-8061-3002-6. Retrieved 17 September 2015. ^ ""Exploring" a relationship". Ancestry.com. Archived from the original on 22 July 2015. Retrieved 17 September 2015. ^ "Mackenzie". Avoch Heritage Association. Archived from the original on 2 July 2015. Retrieved 17 September 2015. ^ "Timeline". Crowsnest Highway. Retrieved 17 September 2015. ^ "Alexander Mackenzie Becomes the First European to Cross the Continent of North America at Its Widest Part". Science and its Times. Gale. 2000. ISBN 978-0-78763-932-7. Retrieved 17 September 2015. ^ a b Mackenzie, Alexander (1902). 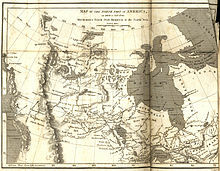 Voyages from Montreal Through the Continent of North America to the Frozen and Pacific Oceans in 1789 and 1793. Vol. I. New York: A. S. Barnes & Company. Retrieved 17 September 2015. ^ Fort Fork National Historic Site of Canada. Directory of Federal Heritage Designations. Parks Canada. ^ a b Mackenzie, Alexander (2001). The Journals of Alexander Mackenzie: Exploring Across Canada in 1789 & 1793. Santa Barbara, California: Narrative Press. p. 198ff. ISBN 1-58976-036-0. Archived from the original on 17 October 2015. Retrieved 18 September 2015. ^ "Sir Alexander Mackenzie". Bella Coola Grizzly Tours. Mackenzie Heritage Trail, British Columbia. Retrieved 17 September 2015. ^ a b Marshall, Tabitha; Mercer, Keith (4 March 2015) [7 January 2008]. "Sir Alexander Mackenzie (Explorer)". The Canadian Encyclopedia (online ed.). Historica Canada. ^ Morton, Arthur Silver; (Lewis G Thomas) (1973) . A History of the Canadian West to 1870–71 (2nd ed.). Toronto, Ontario: University of Toronto Press. ISBN 0-8020-4033-0. ^ First Crossing of North America. Canadian Register of Historic Places. Retrieved 23 November 2011. ^ Mackenzie, Sir Alexander National Historic Person. Directory of Federal Heritage Designations. Parks Canada. ^ Poser, William J. (2004). "The first record of the Carrier language". In Holt, Gary; Tuttle, Siri (eds.). Working Papers in Athabaskan Languages. Working Papers #4. Fairbanks, Alaska: Alaska Native Language Center. ^ Mackenzie, Alexander (1903). Voyages from Montreal Through the Continent of North America to the Frozen and Pacific Oceans in 1789 and 1793. Vol. II. New York: A. S. Barnes & Company. Retrieved 17 September 2015. ^ "Alexander Mackenzie rose". Archived from the original on 15 June 2010. ^ Erickson, Bruce (2013). Canoe Nation: Nature, Race, and the Making of a Canadian Icon. University of British Columbia Press. ^ "Fonds - Canada Sea-to-Sea: Alexander Mackenzie Bicentennial Expeditions fonds". Chichester, Henry Manners (1893). "Mackenzie, Alexander (1755?-1820)" . In Lee, Sidney (ed.). Dictionary of National Biography. 35. London: Smith, Elder & Co.
Chisholm, Hugh, ed. (1911). "Mackenzie, Sir Alexander" . Encyclopædia Britannica (11th ed.). Cambridge University Press. "Biography of Alexander Mackenzie". Dictionnaire des parlementaires du Québec de 1792 à nos jours (in French). National Assembly of Quebec. Explorations of Sir Alexander MacKenzie National Historic Event. Directory of Federal Heritage Designations. Parks Canada. Discovery of the Mackenzie River National Historic Event. Directory of Federal Heritage Designations. Parks Canada. First Crossing of North America National Historic Site of Canada. Directory of Federal Heritage Designations. Parks Canada. Exploration of the Fraser River National Historic Event. Directory of Federal Heritage Designations. Parks Canada. Slave River Rapids National Historic Event. Directory of Federal Heritage Designations. Parks Canada. Wade, Mark S. (1927). Mackenzie of Canada: The Life and Adventures of Alexander Mackenzie, Discoverer. Edinburgh and London: William Blackwood & Sons. Wikimedia Commons has media related to Alexander Mackenzie (explorer).